COOL: Andy Murray cried – so now we like him | Everything is cool. Yesterday, as Roger Federer and his fit legs landed a 7th Wimbledon victory , I picked up the remote with a mind to switch over. The ceremonial cup and tray giving by the Duke of Kent gets slower and slower each year. But I wanted to see what Andy Murray had to say, even though he’s given me no reason to support him other than representing Britain, he really had given it everything… and fallen over loads too! Had he succeeded in undoing Feder’s determination, the nation would have been shocked and pleasantly surprised to see him become the first man in 76 years to win the British title. But without a racket in his hand, Andy Murray managed to achieve the exact same response with his emotional runner up speech. Which touched me in ways I never (hoped) thought Murray could. Oh! I thought. Murray’s crying?! 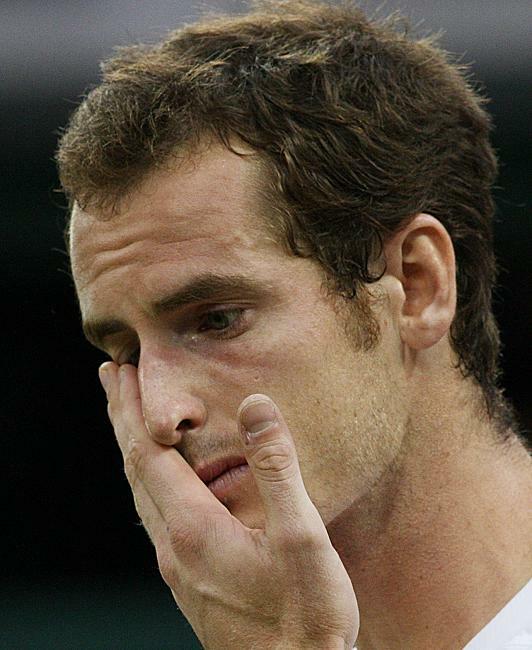 Andy hard-annoyed-face Murray is crying actual tears on Centre Court. Stood there battling the teary bolus in his throat, faced with god knows how many people just clinging onto this rare display of sentiment, he put the mic closer to his mouth. And as he congratulated Federer with an innocuous joke about being 30, I felt tears roll down my own fickle face. The camera panned to his girlf who – like her man, had worn a widow’s poker-face all afternoon – was also now in tears. Mum, Judy Murray – tears. “Everybody always talks about the pressure of playing at Wimbledon, how tough it is,” continued Murray. “But the people watching make it so much easier to play,” he finished and choked. The crowd wept and Wimbledon had officially descended into one big crying festival. And in a flat somewhere in East London, I sat sobbing. Rather unexpectedly, the once beautifully tanned Federer, with his pretty arms and floppy international hair, now looked to me like some kind of Cyril Sneer person “Go on, let him hold the cup!” I yelled at the TV. “He’ll win one grand slam, at least”, said Federer. “SHUTUP Federer!” You may have won 7 times but that doesn’t mean you can now predict IF and HOW many times other tennis players will win. “The support has been incredible, so thank you,” Murray added before exiting – in tears – to one final standing ovation. Murray cried in Melbourne in 2010 as well. It was bound to happen. Andy – well played, mate. You’ve done Scotland proud. Your homeland salutes you. Chin up, mate. You’ll win it yet!